From 5 July to 5 August 2018, K Food Holdings, operator of Chir Chir Fusion Chicken Factory, Masizzim, Kogane Yama, Nipong Naepong and NY Night Market, recently launched the 'K FOOD WHEEL OF DAEBAK', which is a sure-win “wheel of fortune” promotion through which customers dining at any of the aforementioned restaurants will be entitled to one spin of the wheel for every $50 spent in a single receipt. No matter where the wheel is spun to, customers will surely be rewarded with some form of food or dining vouchers, such as a $50 dining voucher or a free order of Ranch Cheese Fries. We visited one of its participating oulet, NY Night Market which is a Korean-American fusion food joint located at Westgate. 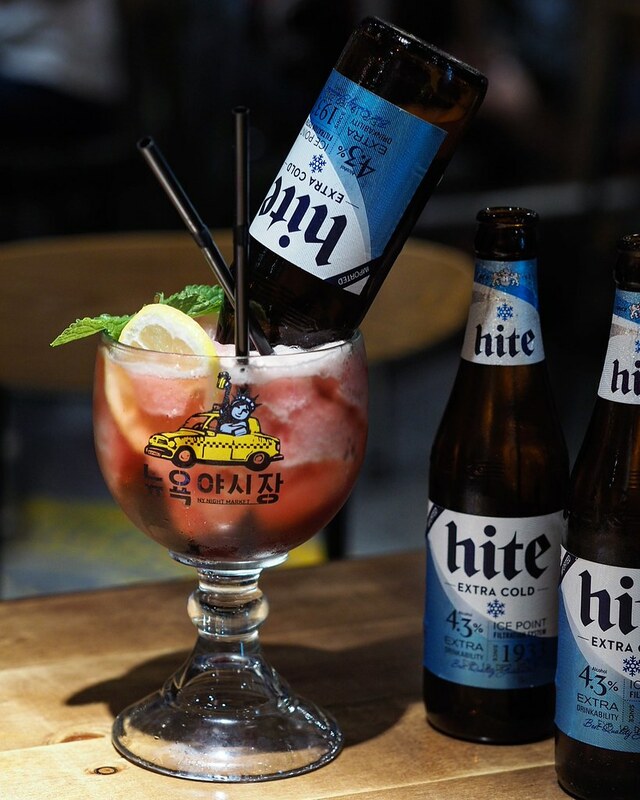 First established in Seoul Korea, this popular chain specialises in international street food whee one can find in New York City, offering Western food items such as fried chicken, pasta and pizza infused with Korean elements. 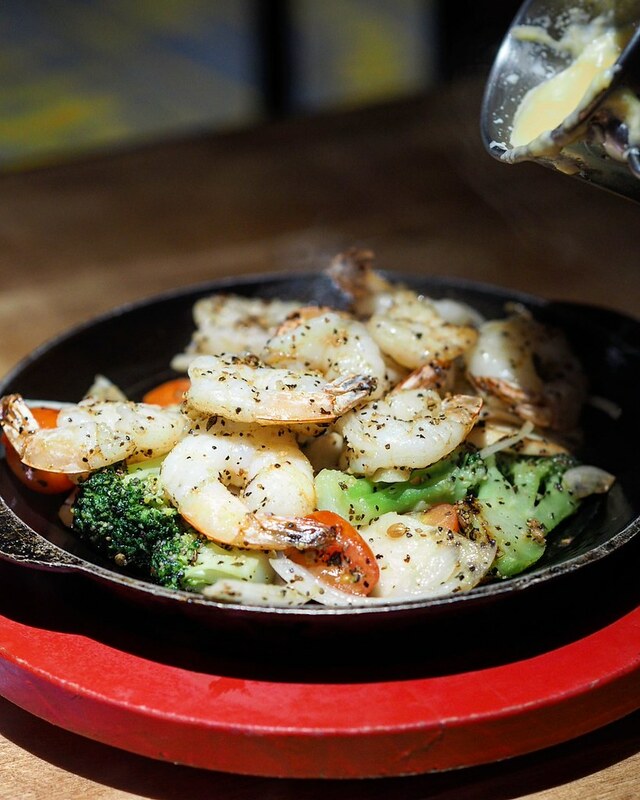 The Waterfall Cheese Shrimp ($13.90) features perfectly succulent grilled prawns with broccoli, king oyster mushrooms and cherry tomatoes blanketed in a waterfall of lusciously creamy mozzarella and emmental sauce from a mini bucket. Packed full of creamy cheesy goodness, this is definitely a dream come true for cheese-lovers. 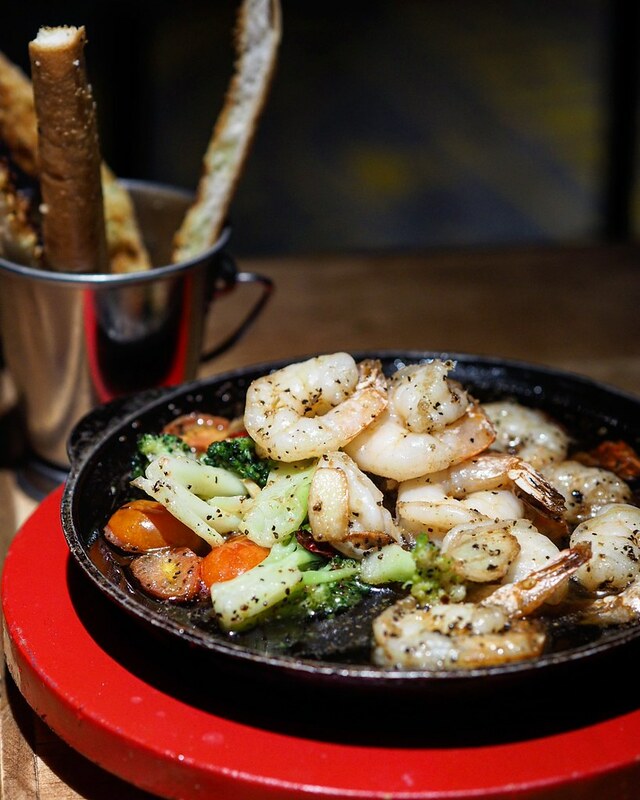 A Spain Tapas-inspired dish, the Gambas Al Ajillo ($13.90) comes in a sizzling plate of sauteed prawns in garlic and olive oil, served with crispy toasted garlic breadsticks. Similar to the waterfall cheese shrimp dish. the prawns are fresh and juicy with a slight peppery aftertaste. The rich flavours of garlic and olive oil makes the dish extremely fragrant. We recommend mopping up all those delicious olive oil with the breadsticks. With alcohol going at discounted prices during happy hour till 7pm, the Blood & Seoul ($10; UP: $14.90) was quite a catch with lime Mojito, raspberry and strawberry puree, lemon juice and mint cocktail mix in a huge glass, and a beer bottle inserted upside down into the glass. Finish at least half of your drink before lifting the beer bottle to allow more beer to flow into the glass. While the cocktail is mildly sweet with a refreshing fruity taste, bitter hints of alcohol become more prominent as the beer slowly empties into the glass. 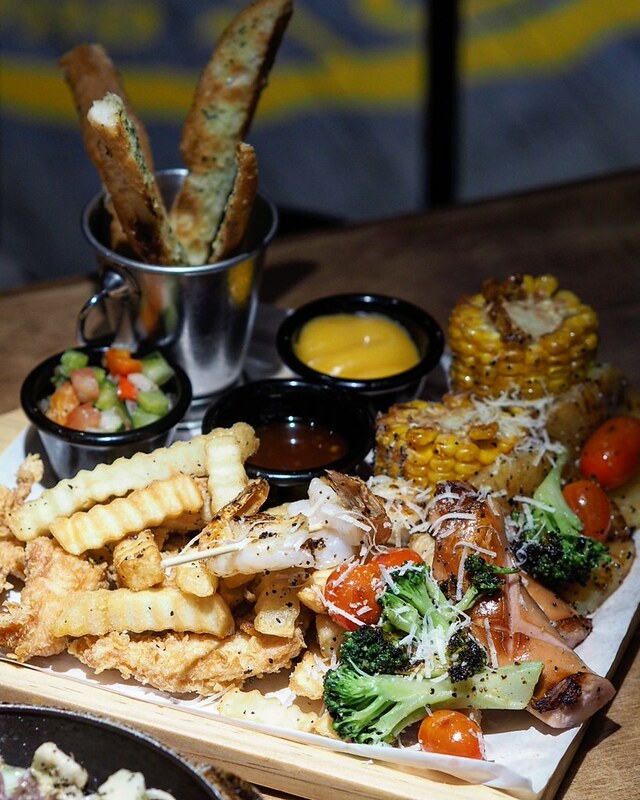 The Party in New York ($30.90) features the hearty surf 'n' turf platter filled with sausage, cajun fried chicken, prawn, french fries, pineapple and corn. 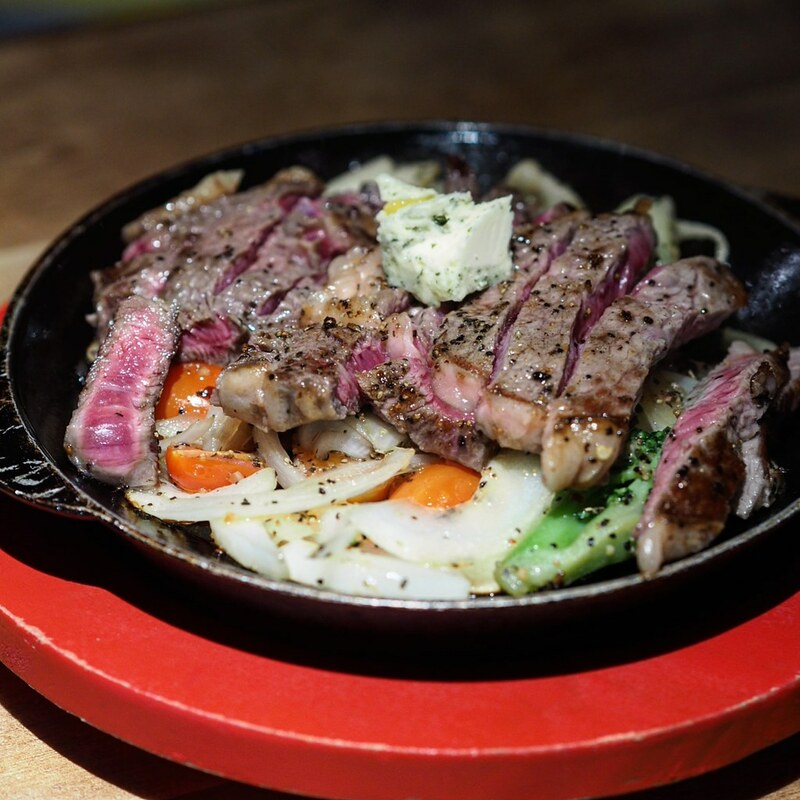 It also comes with a sizzling hotplate of Beef Steak. Cooked medium rare, these 150g of grilled flat iron steak is tender and juicy, perfectly seasoned with basil and served with rich BBQ sauce and butter. NY Night Market is the perfect place to indulge in some delicious and affordable Korean-Western fusion street food over a get-together with friends in a casual fun setting. If you're ever missing the buzzing night markets in korea, come by NY Night market to relive the experience again! 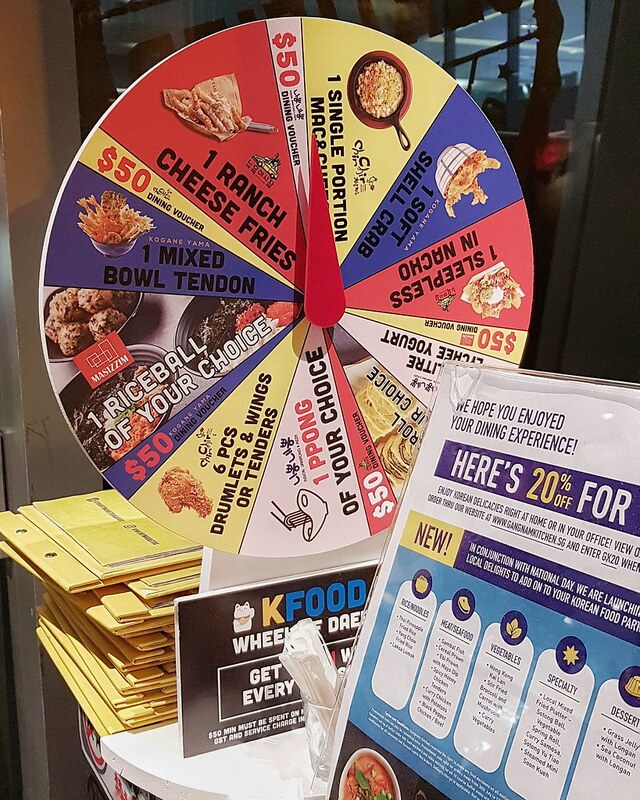 The 'K FOOD WHEEL OF DAEBAK' is available from 5 July to 5 August 2018, where diners are entitled to a single spin of the wheel with every $50 spent in a single receipt. WIth a sure-win concept, stand a chance to win from a variety of vouchers available such as a $50 dining voucher, order of Ranch Cheese Fries or Sleepless in Nacho at NY Night Market, or at other participating outlets.